Salt Ager | KönigsSalz. Weil Salz nicht gleich Salz ist. Until the seventies Dry Aged Beef was well known; However, then it became forgotten. 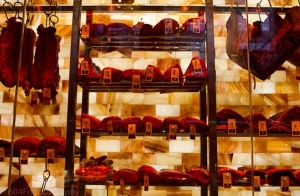 Dry Aged is dry matured meat having an extraordinary tender and intensive flavour. This is ensured by a new type of meat maturing refrigerated cooler in combination with the unique SALARIUM®-climate; by this moisture evaporates from meat creating a greater concentration of beefy flavor and taste. The installation of the KönigsSalz QuickRailSystem® enables this unique climate in your cold storage room.